Think India, Delhi organized National Symposium on Constitutional Law on 23rd September 2017 at Malviya Smriti Bhawan, New Delhi. The symposium was divided into 4 Sessions titled Locating Indian Constitutionalism, Federalism and Art. 356, Rights and Duties in current perspective and Courts and Tribunals: Journey so far and way ahead. The Symposium attended by over 150 students countrywide was inaugurated by Additional Solicitor General for India Mr. A.N.S. Nadkarni alongwith Adv. Sandeep Mahapatra with Senior Advocate Mr. V.Shekhar. Mr. Nagaraj Reddy, Think India Incharge also joined later. 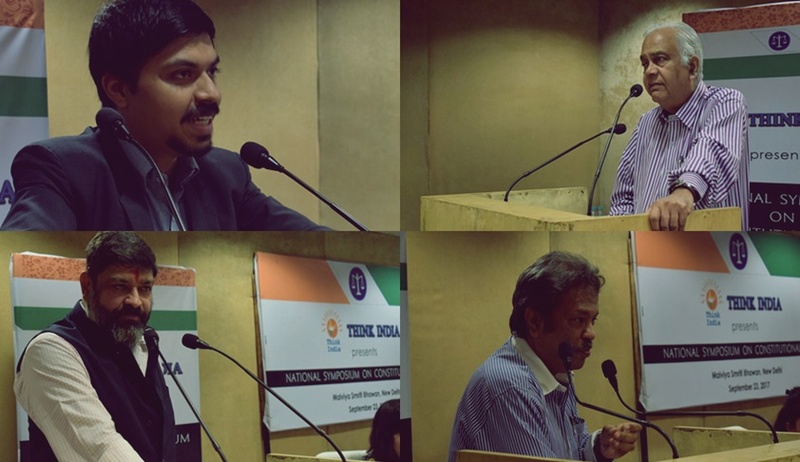 The key speakers were Mr. Nadkarni, ASG, Senior advocates Mr. Shekhar Naphade, Mr. R.K.Raizada and Mr. V.Shekhar and Advocates Mr. Namit Saxena, Mr. J. Sai Deepak and Mr. Hanu Bhaskar. Retd Judge of the Delhi High Court Justice Mool Chand Garg and Chairperson of Central Administrative Tribunal Justice (Retd) Permod Kohli also graced the occasion. In a healthy interaction with the attendees Mr. Nadkarni attacked judiciary for encroaching upon other domains gradually. Mr. Namit Saxena opened the sessions with dissecting the constitutional understanding into written and unwritten constitutions and shared interesting anecdotes. Following him, Mr. Hanu Bhaskar related law and constitutional principles with common logic. In his brilliant speech, Senior Advocate Mr. Shekhar Naphade traced the history of misuse of Article 356 and shared the importance of Article 365 which was endorsed fully by Justice Garg. In the post lunch sessions, Mr. J Sai Deepak and Mr. V. Shekhar enlightened the gathering on Rights and Duties in current perspective and Senior Advocate Mr. R.K. Raizada and Justice (Retd) Permod Kohli discussed tribunalization and the journey so far and way ahead on it.